(Bridgeport, Conn., Jan. 19, 2016) – The Bridgeport Bluefish have announced the signings of pitchers D.J. Mitchell, Matt Iannazzo, Steven Ames and David Anderson. 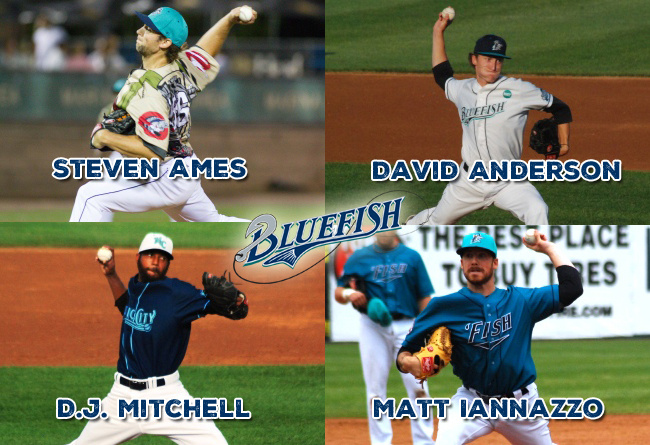 Mitchell and Iannazzo both return to the Bluefish for their third season, while Ames and Anderson will being their second season in Bridgeport. Mitchell enters his eighth season in professional baseball and third in the Atlantic League. Last year with Bridgeport, the North Carolina native started 19 games, recording six wins with a 2.89 ERA and 86 strikeouts over the course of 112.0 innings pitched. Mitchell made two stops in The Show, pitching for the New York Yankees in May and July, 2012. He was also the Atlantic League All-Star game starter for the Liberty Division team last season, and was the first hurler to throw a pitch with the new red and blue stitched baseball, which is being displayed at the National Baseball Hall of Fame in Cooperstown, N.Y. In four Major League games, the right-hander recorded a 3.86 ERA and two strikeouts in 4.2 innings. The 28-year-old began his professional career in 2009 after being drafted by the Yankees in the 10th round of the MLB draft. That season he appeared with the Single-A Charleston RiverDogs of the South Atlantic League and the High-A Tampa Yankees of the Florida State League. The following year, he played with Double-A Trenton of the Eastern League and eventually was moved up Triple-A Scranton/Wilkes-Barre of the International League, where he spent parts of three seasons. D.J. has also played at the Triple-A level in both the Seattle Mariners and New York Mets organizations. In 164 Minor League outings (136 starts), the pitcher has a 62-43 record with a 4.15 ERA, four complete games, two shutouts, and 630 strikeouts in 828.0 innings. Before beginning his professional career, Mitchell attended Clemson University and led the Cape Cod Baseball League in strikeouts during the 2007 summer for the Bourne Braves. Iannazzo returns to his hometown Bluefish for his third season in the Atlantic League and fifth of professional baseball. Last year with Bridgeport, the Norwalk, CT native appeared in 31 games (19 starts) and picked up five victories with a 4.57 ERA and 77 strikeouts in 122.0 innings of work. Matt began his professional career in 2012 after being signed as a free agent by the Chicago Cubs organization. That year, he appeared with the Arizona League Cubs and the Short-Season Class A Boise Hawks of the Northwest League, as well as High-A Daytona of the Florida State League. In 2013, the 26-year-old again pitched for Boise and also spent time with Single-A Kane County of the Midwest League. He compiled a combined 2-2 record with a 3.38 ERA and 26 strikeouts in 24 relief appearances, totaling 26.2 innings pitched. In 101 career minor league games, the lefty has collected 12 wins with a 4.36 ERA and 188 strikeouts in 299.0 innings pitched. Before beginning his professional career, Iannazzo attended and played ball at the University of Pittsburgh. Ames returns to Bridgeport for his second season in the Atlantic League and eighth of professional baseball. Last year with the Bluefish, the former Major Leaguer made 33 relief appearances, collecting one victory with a 4.45 ERA and 28 strikeouts in 28.1 innings pitched. The 27-year-old made his professional debut after he was selected by the Los Angeles Dodgers in the 17th round of the 2009 MLB draft. He spent five years within the Dodgers organization, reaching as high as the Triple-A level. In 2013, the right-hander was traded to the Miami Marlins organization, where he would make his big league debut that same year. He spent one more season with the Marlins minor league affiliates before coming to Bridgeport. In 235 career minor league games, Ames owns 13 wins with a 2.66 ERA, 65 saves and 315 strikeouts in 277.2 innings of work. Before beginning his professional career, Steven attended and played ball at Gonzaga University. Anderson returns to Bridgeport for his second season of professional baseball. Last year, the rookie made seven starts for the 'Fish and earned two wins with a 2.68 ERA and 25 strikeouts in 40.1 innings pitched. The 22-year-old made his professional debut with the Bluefish after attending a mid-season tryout. Prior to coming to Magic City, David attended and played ball at Muhlenberg College.